After posting a request for levels here and on the Labyrinth Lord forums, I’ve decided to stock Erdea Manor for characters of levels 3-6, averaging at the mid-4’s. And what’s a great “level 4” monster? Ogres. Here to grind your bones into flour! I also decided to keep the dwarves that we had when we adventured here using the random dungeon stocking rules from the basic rulebook for a DM-less game last year. A group of ogres has moved into the ruins of Erdea Manor in the last week following a treasure map that their leader acquired from some unlucky adventurers that finished their careers as ogre soup mix. They quickly took over the surface area of the manor, and have isolated or slain the other creatures that were here before – with a group of dwarven holdouts still sealed into the old keep. Vera, the ogress who leads the clan, has already ventured further into the ruins, and the rest of the clan is here to watch her back and they will return if chased off in order to check to see if she returns from the depths. 1. Manor Ruins. The manor grounds stand in ruins after several centuries of neglect. Remains of a few structures can be found with most remaining walls having been worn down to 3 to 5 feet in height. Two structures have withstood the test of time – the old keep (area 3) and a 20 foot tall tower near the old crypts (area 4). The well in area 2 remains mostly intact also. In the hillside to the west of the manor structures is a staircase descending into the depths (and to area 6). 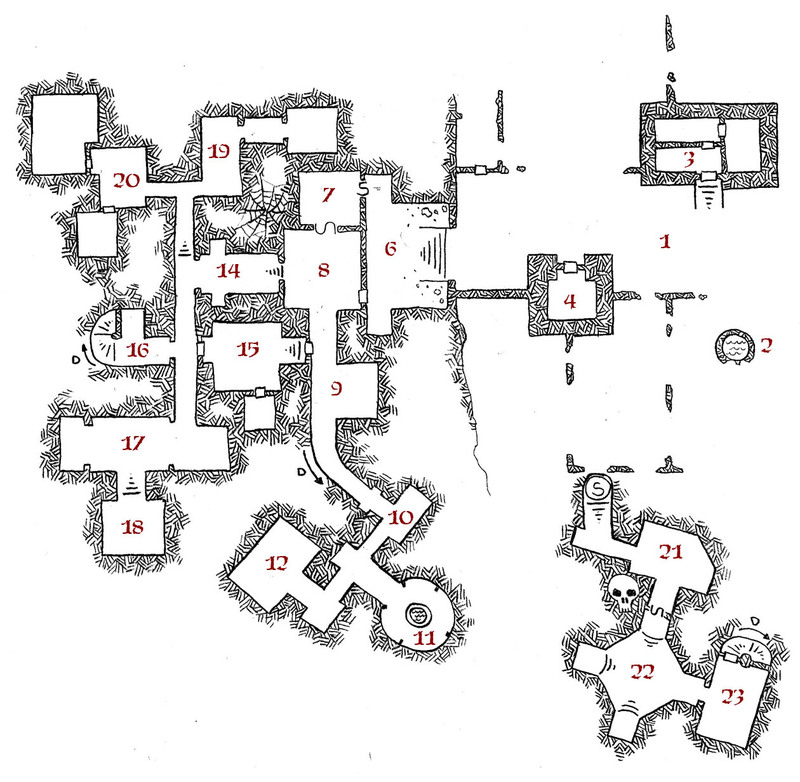 There is also a secret door in the southern ruins leading to area 21 and the depths to Erdea Manor that is unlikely to be discovered without finding it from below or with the use of a treasure map. 4 Ogres are camped out in the ruins (mostly near ruins in the lee of the hill where the one ancient oak door still stands) guarding against intruders and making sure the dwarves in the keep are “under control”. A fight here may be observed by the dwarves in area 3, and will probably be joined by the ogre in area 4. 2. The Well. Unlike just about any other dungeon environment, the well is just that, a fairly deep surface well eight feet across and 60 feet deep, the last 20 of which are submerged under clear water. There is a rope ladder bundled up on the ground beside the well, left here by the dwarves when they investigated it to see if there are any secret doors along the shaft. 3. Dwarven Keepers. The old keep of the manor grounds is still strong and easy to defend, with the main door 8 feet above ground level and approached by steep stone stairs. The keep is home to fifteen dwarves that survived the ogres overrunning the grounds. The dwarves stocked the keep for just such an emergency, and are good to remain here for a few weeks to a month if necessary. Having observed the ogres a bit, they believe that the ogres will not stick around for long, and are willing to sit out the so called “ogre siege” in here. They will not open the locked and barred door for anything at this point, wanting nothing to do with the ogres or the ogres’ enemies. The dwarves have 2,000 pp in a locked chest trapped with two different poison needle traps (one for the lock, a second for anyone opening the chest). The leader wears a jeweled golden beard-clasp worth 1,200 gp and her mate bears a pair of ceremonial platinum hand axes worth 600 gp each. 4. Guard Post. This tower reaches up twenty feet into the sky. The roof is long gone, and the interior of the heavy-walled tower is open to the elements. However it does provide nice protection from the wind and a place to light a camp fire without it being seen for miles around. Willhelm, an ogre of great culinary skill, is in the tower cooking dwarf-bone-bread over the fire. He will join his brethren in area 1 if he hears a fight out there, hurling a flask of flaming oil into the fight before running in to melee. Willhelm carries a sack which contains a jar of dwarf-bone flour, 300 gp, and a large wheel of excellent cheese. 5. Nowhere. There is no area 5. I screwed up while keying the map. Sue me already and get it over with. 6. Entrance. The entrance area is a mess after centuries open to the elements. There is a lot of debris, both naturally occurring and from the ruins of the manor, scattered about the floor of this high-ceilinged chamber. Barely visible faded murals on the west wall depict a team of knights bearing the Erdea family crest on their chargers looking down over a battlefield between human and elven troops. The door to area 8 is built into the hill the chargers are standing on, made to look like the entrance into a cavern. The secret door into area 7 is disguised into an illustration of a pile of elven bodies. It is opened by pushing in the rolled-back eyes of one of the dead elves, hooking the fingers into the recesses, and pulling the door outward into this room. 7. The Trophies. This secret chamber is where the trophies from the war between the races of man and the ancient elven race of the Kale were kept by the Erdea family. Four suits of fine elven plate mail hammered from the stuff of other worlds are here – each appearing to be made of heavy steel with a purple burnish to it. One of the four suits is a suit of +1 plate mail that bears a dark curse – every month the wearer of the armour must slay a defenseless sentient humanoid or suffer a cummulative -2 penalty to his Wisdom as the armour slowly drives him insane. Replicas of several elven weapons are here also, but none are of actual battlefield quality. 8. Antechamber. This is the central gathering point for Vera’s clan of ogres within the complex. There is only one ogre here now, but the ogres in other rooms in this level often come by here for food or to rest. The bodies of a half-dozen goats are hung on wooden pegs on the east and north walls. The secret door to area 7 is opened by removing one of the wooden pegs from the wall and reaching in to press a switch along the bottom of the peg hole. There is always a small fire here, and typically a large pot of tea-like substance on the fire. The two passages exiting from this room have massive and ornate archways over them with the Erdea coat of arms at the peak and both bases of the arch. 9. Wolf Pen. Vera’s pet wolves are being kept in this room. Seven wolves (the eighth is with Vera) are chained to the wall, but the stakes holding the chains are purposefully weakly mounted so the wolves can break free if very excited or in combat. The corridor to the south slopes downward at a 20 degree angle. 10. Storage. This room was used for storage ages ago. A few shattered barrels are all that remain of the stores kept here for sieges and disasters. 11. Emergency Well. This well was used in times of crisis as an emergency water supply for the manor residents. The ogres tried using it, but realized that the shine of water isn’t actually water, but a massive gray ooze that lives in the well. They threw it a few dwarves and it generally stays in the hole because it isn’t hungry. (Treat as a normal gray ooze, but with 6 HD and dealing 3d6 damage). 12. Ogre Storage. Once a small barracks and storage room, this has been converted into the main storage area for the ogres. Three ogres are here along with the clan loot of 10,000 cp, 1,000 gp, and 4 250 gp gems. There is also a barrel of dwarf-parts, a few barrels of fresh water, a keg of beer, two dozen sheep skins and a pile of lumber. This is post 15 of the A to Z Posting Challenge – O is for Overrun with Ogres. Awesome. Just one question…can ogres read treasure maps? Can they even read? Most cannot. But Vera can. I’ll be statting her up on level 2 where she is still exploring. She’s an ogress adventurer. I’d always thought of ogres as fairly intelligent–at least as far as goblins are concerned. But I like this so far, and I can’t wait for the rest of it. I love your maps. I still hope you will write a post showing the artistically challenged (like me) a step be step on your methods. Keep up the great work. 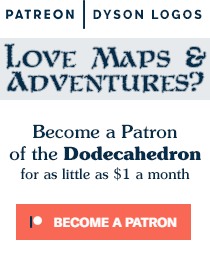 I’ll do such a post before the end of the month as part of the RPG Cartography Blog Carnival. If you still want to correct and put in an area 5, put it behind the door at the top of the map across the entry courtyard from 4. Seems like a natural place for it to go. to me it makes more sense to put it behind 4 so there’s a description of the area with the secret door.